In this page, we will discuss on error: testing 123 error, you will face this error when you try to access your website in this browser, let us understand about this error and discuss the solution. 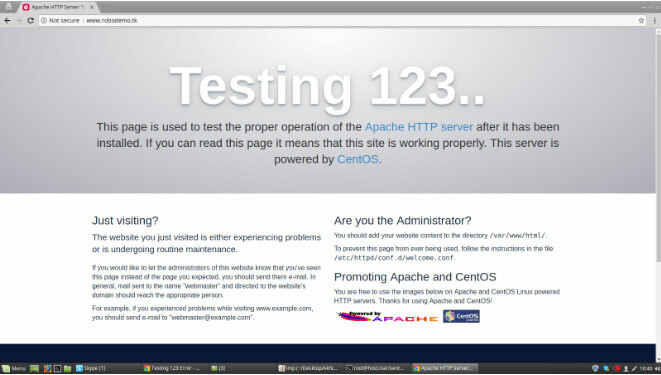 The website is showing testing 123 error in the browser. You have to ensure that, your domain is pointing to the proper IP address provided by HostingRaja and all sources codes are available on appropriate path still showing this error. Sometimes, We get this problem from customers, whose domain is pointing to some other hosting providers. Once you confirm that, you have your domain pointing to correct address. Why this has been issue occurred? This issues may be due to any one of the following problem with HostingRaja VPS or cloud. 1. SSL certificate might have expired few days ago. 2. Ensure that you have placed your source code correctly under the proper path. For example, you have to place your index.php or index.html file in the public_html directory. 3. In Linux VPS or cloud operating system, the case of the file is sensitive. Whereas in Windows OS, it is case-insensitive OS. In linux Index.html and index.html, both are different files, where as in Windows, It it considered as a same file. A cloud operating system will manage, operate the process involved in virtual machines which includes virtual servers and its resources with the cloud environment. The functions in the cloud operating system will depend on the virtual environment you choose. You will be able to manage your tasks wherever you are in a cloud environment. 4. Files or Folders which is placed under HostingRaja VPS or Cloud Server is not having proper Permissions and Ownership. 5. Having more than 1 folder related to ssl certificate.For example, folder name hostingraja.in and hostingraja.in-001 will be present under the path /etc/letsencrypt/live/ So that apache server fails to identify which folder needs to take into consideration. 6. SSL Certficate is not present for your domain which is hosting under HostingRaja VPS or Cloud Sever, but you are trying to access your domain with https on the web browser. One of the major purposes fulfilled by an SSL certificate is to encrypt an information so that it is readable only by the intended parties. Hence an SSL will insert the characters in original information so that one is have an access to it until they have an encryption key. If your domain is running completely on https including images,videos,contents then all these files will stop working and cannot be accessed. Login to ssh using server credentials provided by HostingRaja. Before purchasing a domain name one must check if there is an availability of domain name to be purchased or if it already purchased. You can check the availability of domain name by typing in your domain name in the space provided on top of the website. Go to the browser and once again check the domain along with https. Your Problem is resolved. 3. Case Sensitive: In linux Index.html and index.html, both are different files, where as in Windows, It it considered as a same file So you need to check whether index file is written, In case sensitive or not For example: If you found index file name as Index.php you need to replace it as index.php. 4. Permissions & Ownership: The source code which is placed under appropriate path For Example, public_html must be given with proper file and folder permissions along with proper ownership as apache, by default it will be root. 5. More than 1 SSL certificate folder: SSL certificate module is present under HostingRaja HR Panel for generating SSL Certificate.If you are installing the ssl certificate for your Domain name mutiple times will generate multiple ssl certificate files results in this error. Remove the file which is repeated again with 001. This issue is arised if you delete the SSL certficate and try to install it manually mutiple times. Note: Kindly install SSL using SSL module in hr panel don’t do manual installation. 6. SSL not present: Check for the SSL certificate is present for your particular domain or not if you are trying to open the domain name with https which is not having any SSL certificate it will give you the error which is mentioned above.You need to install SSL certificate for the domain and then use https along with domain name will resolve the error.